Rafting in Arachthos, in the region of Tzoumerka, is a brilliant choice for those looking for an unforgettable rafting. The passages of second, third and fourth degree of difficulty, through gorges and canyons with caves and small waterfalls make rafting in Arachthos an unforgettable experience. The Arachthos river is the eighth longest river in Greece. Its length is 110 km. It’s divided into 4 sections: Upper and Lower Arachthos, Arachthos gorge and Arachthos canyon. Its source is in the Pindus mountains, in eastern Epirus, and flows into the Gulf of Amvrakikos. There are plenty of magnificent rafting routes with many alterations in lands and difficulty level of the river. The route that someone will follow, depends on his rafting experience. An easy rafting route, ideal for beginners, starts from the bridge of Politsa in Ambelochori, and after crossing the most beautiful part of the river, ends at the stone bridge of Plaka. The stone bridge of Plaka is the widest stone-made arched bridge in Greece. The passages are of grade 2-3. The entrance to the narrow canyon of Arachthos is impressive with vertical cliffs of 700m. Another easy rafting path starts from the bridge of Plaka and ends at the bridge of Skoupa. The route is 2nd and 3rd degree of difficulty. Green and impressive rocks dominate the scene. An impressive route which follows the big ravine of river and leads to a splendid gorge begins from Tsibovo bridge, in the village Charokopos, and ends at the stone bridge of Plaka. It crosses the passage of “Sympligades” 4th degree, while it continues with consecutive rapids till the end of the route. The waterfalls, the underground river of Klifki, the impressive nature and the one arc stone bridge of Plaka, make this rafting a unique experience. 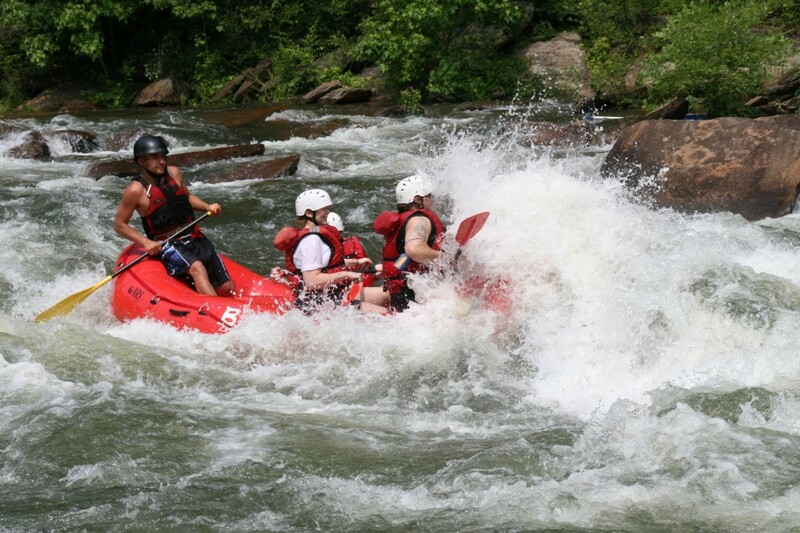 A rafting itinerary for experiences riders. A rafting itinerary for experienced riders starts from Charokopi bridge and ends at Skoupa bridge. It’s a downhill of 4th degree of difficulty, with spectacular waterfalls and the underground river Klifkis. Another 4 degree of difficulty route is from Krapsis bridge to Tsibovou bridge. The Lakmos Mountains on the left bank, the small but beautiful canyon and the natural stone bridge “Papastathis” make the descent amazing. Feel free to check for more things to do in Tzoumerka and the nearby areas.